I really like selling on Amazon. It is by far and away my favorite place to sell. The main reason is because people love buying on Amazon so the customers are there but Amazon also makes it very easy and lucrative with FBA. For the most part, when I am fulfilling something on my own, my prices just can't compete with what I can offer on Amazon FBA. I often have to sell for more with self fulfillment and still make less! Let me first point out that my eBay business is still very, very small. It is pitiful compared to Amazon but that's ok. 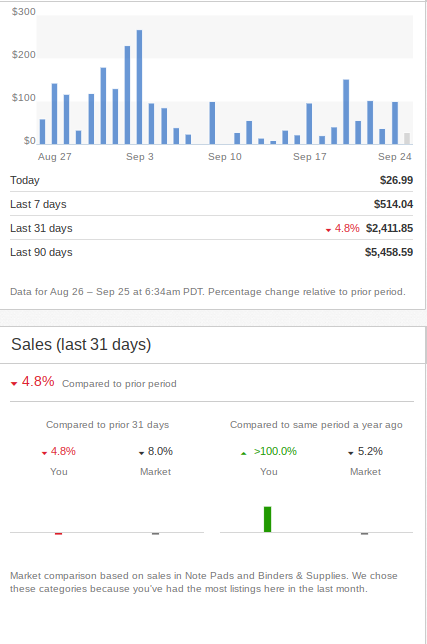 When you consider that I have $5,600 of sales on eBay in the last 12 months, it doesn't seem so bad that $4,700 of them are within the last 60 days. You need to start somewhere! Amazon FBA storage prices have gone through the roof! I have many items at Amazon that I can't afford to keep at Amazon and the price on Amazon is either too cheap for me to sell or I can't sell it fast enough just at Amazon. The monthly storage fees are bad but this is mostly a worry about Long Term Storage fees. If I didn't radically change the way I did business I would have fees that would get out of control! My merchant fulfillment business on Amazon (mostly Seller Fulfilled Prime but not entirely) has started to increase. This is pretty much for the same reason. I don't pay extra storage on anything in my warehouse. Previously if I bought 50 of something I would send all 50 in immediately. I now send in only 5-18 and put a few up with Merchant Fulfillment immediately so that I am in stock even earlier. If the FBA items sell I'll send in more but if they don't I wont send any more in. That means that I'll hopefully never pay storage and LTSF on more than the original 5-18 I sent in. I might end up being out of stock more which makes it important again to have self fulfillment available. All this means I have more inventory in my warehouse available to use to fulfill orders for eBay. Busy seasons like Q4 are exceptions. I will send a lot more in late November even if I don't know exactly how many will sell. More profitable sales are good, right!? Credit Card Rewards for shipping and purchases are kind of nice but this is very much a side benefit. You can use the Amex Business Gold for 3x Membership Rewards or the Chase Ink Business Preferred for 3x UR for shipping. If you are doing Seller Fulfilled Prime you have to purchase shipping through Amazon so no credit card rewards for that. If I'm selling more that means I have to buy more which means more credit card points. There has been one large revelation to me that has really driven my eBay sales. eBay has a lot fewer returns than Amazon. You can even choose to not allow for returns but even allowing for returns the return rate is lower. You have to bake in your return rate into Amazon margins. eBay can't lose your stuff like Amazon FBA does. Amazon loses a lot of stuff! There is a certain percentage of shrinkage that you have to compensate for when you sell on Amazon. Unless your workers are stealing from you or losing items as well, if it is in your warehouse, it isn't getting lost. My primary objective is to make money on eBay but a close second is mitigation of Amazon storage fees. Even if I just breakeven after fees on all of my eBay sales (I have been making a small amount of money), I am still saving a lot of money in Amazon fees from all the storage I'm no longer paying! Lack of Time Investment - Automation to the Rescue! Automation may make me an irrelevant sack of potatoies in the economy at some point (Read Yuval Harari's book Home Deus: A Brief History of Tomorrow if you want to be scared about this stuff. Before that you should probably first read his original book Sapiens: A Brief History of Humankind which is one of the greatest books I've ever read - both affiliate links) but for now it's really nice! Either way, I use automation for 90%+ of my eBay selling through Joe Lister (affiliate link). I've talked about Joe Lister before. Joe Lister automatically turns your Amazon listings into eBay listings in less than an hour. 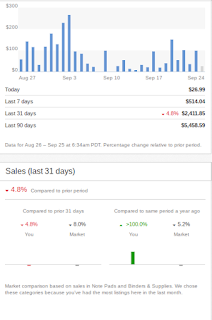 You can tell Joe Lister to price on eBay to earn the same amount of money as on Amazon and they will automatically calculate eBay fees and fulfillment fees for you to arrive at the correct price. You can also ask them to make more or less money per sale compared to your Amazon price. They constantly monitor your Amazon inventory so that you don't sell something on eBay you don't have in stock and when an eBay sale comes in they initiate a Multi Channel Fulfillment order from your Amazon inventory to fulfill this order. They will then update the tracking on eBay once available. You need to literally do nothing, except pay them of course. At a certain point, I quit Joe Lister because it just wasn't working out as well as I would like and I was paying a lot of money in listing fees. I hate listing fees! eBay charges $.30 a listing if you don't have a store or a promotion. 1) My prices. Instead of telling Joe Lister to price at the same profit levels on Amazon and eBay (making my eBay prices higher) I am willing to sell for 2% lower margins. I might even lower that at some point. You can always change individual listings if you think it is selling for too little. 2) I increased my Joe Lister plan to 250 listings. That means that I just have more listings on eBay which might sell. I used to pick my top 50 and 46 of them didn't sell at all. Now I can pick 95% of my active listings on Amazon. 3) I opened an eBay Store. I started with a basic store. It comes with 250 free listings which means that I am no longer getting dinged with listing fees. I've had months where I've paid over $50 in just listing fees which was awful. Also, eBay's commission goes down from 10% to 9.15% with a basic store (remember there is still the 2.7% paypal commission). If I can sell $2,500 worth of merchandise on eBay every month (I've been doing about that the last 2 months), that .85% savings will equal a savings of $21.25 monthly, which is exactly equal to the $21.25 monthly fee for the store (when you sign up for a year at a time). So I'm saving on listings and hopefully the commission savings is breakeven or better for the store fee. If I can make $60 a month in profit on top of that I can mitigate the Joe Lister fee and every sale is one less item I pay storage on. If I am selling $2,500 a month, $60 is a margin of 2.4%. Hopefully that's sustainable. My fixed fees are set so if I can increase it to $5,000 a month of sales, the extra sales will only be profit and not paying for any listing fees or Joe Lister fees so I can actually make some money besides just lowering storage fees. At some point if sales increase I will probably pay a developer to do something similar to Joe Lister for a one time fee and make my money back over time. My expectations for eBay are minimal (at least breakeven on $2,500 a month of sales on average) and then I consider this a win. My time input is very low since almost everything is automated. So far eBay has surprised me with how many orders I've been receiving. I hope to continue to be surprised with increased orders!